Shopping for a new Nissan Maxima? Is anyone paying attention anymore? We’d opt for a better-equipped, and sport-oriented 2019 Maxima SR if we could. It’s the closest to the “four-door sports car” ethos. The 2019 Nissan Maxima has a sense of urgency. 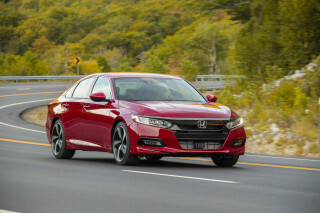 The mid-size sedan was refreshed this year with a newer snout and interior to fit onto its shapely body. The Maxima has always been Nissan’s sportier sedan—compared to the related Altima—if anyone’s still looking for that sort of thing. Like last year, the Maxima is available in S, SV, SL, SR, and Platinum trim levels and costs about $35,000 to more than $40,000. The changes this year are relatively minor—a new mane and tail, some dressier interior trims, too. The Maxima’s profile has always been muscular and shapely, which we appreciate. Under the hood, the story’s mostly the same. A well-worn 3.5-liter V-6 makes 300 horsepower in the Maxima and mates to a continuously variable automatic transmission (CVT) to power the front wheels only. That’s not exactly a thrilling combination, but it’s enough to overwhelm the front tires briefly at stoplights for a cheap grin. The Maxima SR is the sporty grade among the lineup, and probably the better choice considering the four-door’s sporty past. The SR gets beefier suspension bits, tall 19-inch wheels, and steering wheel-mounted paddle shifters to wring out the most from the engine. Inside, the Maxima is most comfortable up front, with supportive seats and a cockpit oriented toward the driver. Despite 109.3 inches between the wheels, the Maxima’s rear seat is relatively cramped and its trunk is small for the class. Along with visual improvements, the Maxima added a raft of active safety features to most models that includes blind-spot monitors and adaptive cruise control. All Maximas can automatically brake to avoid, or mitigate, forward crashes. 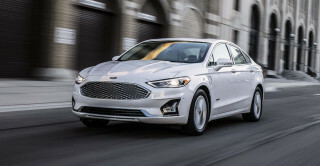 Base models are equipped with 18-inch wheels, cloth upholstery, an 8.0-inch touchscreen with Apple CarPlay and Android Auto compatibility, Bluetooth connectivity, and two USB chargers. Top trims can add soft leather, 19-inch wheels, premium audio, and navigation. Sporty and muscular, the 2019 Nissan Maxima is a welcome break from staid sedan shapes. This year, the Nissan Maxima received a facelift that helped smooth some of the rougher corners we found on the 2018 version. The Maxima’s new nose is more dramatic this year, dipping further into the V-shaped grille and it’s better for it. The lights are updated too, with a more dramatic signature that reads more upscale to us. Around the sides, the Maxima is still dramatic. 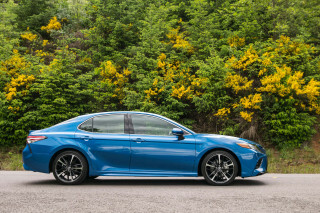 It’s a refreshing take among sedans that typically look dowdy, appliance-like, and have fewer features than our refrigerator sometimes. Kudos to Nissan for still trying, if any shoppers are still paying attention. Maxima SR models add sportier touches like a rear spoiler and smoky eyes up front, but every Maxima looks racy. Inside, the Maxima cants its instruments and controls toward the driver, a marked difference compared to the workaday Altima. Its centerpiece is still a large, 8.0-inch touchscreen for infotainment but the cabin isn’t brimming with an overload of tech. This year, top trims can be fitted with brown, quilted leather, which is an upscale touch. The 2019 Nissan Maxima is sportier than an average sedan, sure. But is it sporty? We’re not convinced. 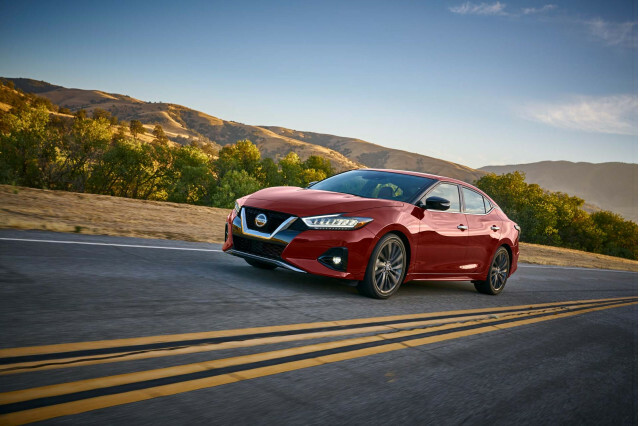 Compared to the related Altima, the 2019 Nissan Maxima is a driver-first car with more feeling than a typical mid-size sedan. Compared to the Maximas of yesteryear, the 2019 version is a little less thrilling. The V-6 under the Maxima’s hood is a horse that’s been in Nissan’s stable for a while now. The 3.5-liter V-6 makes 300 hp and 261 pound-feet of torque, but most of its power is reserved high in the rev range. That means keeping our right feet buried deep in the throttle where the CVT prefers we don’t mingle and its high-revving noises were our first clue. Nissan fits active noise canceling to SL, SR, and Platinum trim levels, where it’s appreciated (SR grades get a symposer that replicates a mildly sporty tune for the cabin). What’s left is a quiet riot under the hood, which is mildly entertaining, but also not fitting a car that can cost upward of $40,000. The Maxima’s steering is bright, thanks to heavier weight and a thicker steering wheel than most sedans. In our drives we’ve noticed some body roll—even on the SR’s stiffer springs—on turn-in, but the Maxima still prefers to be driven. Its electric steering is well-weighted, but also a little numb. The Maxima most often runs on smooth-riding 18-inch wheels, but top trims and SR models get 19 inchers. SR versions add thicker sway bars and more responsive brakes, too. Full-size shadow but mid-size space, the 2019 Nissan Maxima is on the small side. The 2019 Nissan Maxima has full-size dimensions outside, but only mid-size space inside. It’s smaller than the related Altima, surprisingly. The front seats are supportive and all-day comfortable, shod in base cloth, grippy synthetic suede, or more often, real leather hides. Even base seats are power adjustable, somewhat rare among mainstream sedans. The rear seats are small—smaller than you’d expect from a sedan this size, anyway. On paper, the Maxima sports 34.2 inches of rear seat leg room, which is on par for a smaller class. The rear seats are deeply sculpted and passable for two adults, but only two. The Maxima’s roofline eats into available head room as well, and three across isn’t ideal for any longer than a ride to lunch. For better comfort and more space, the related Altima is a better fit. Inside, the Maxima sports quality materials and a handsome layout—better for 2019 with the optional top-trim, diamond-quilted leather. The Maxima’s trunk offers 14.3 cubic feet of cargo space, which is small for its class. The 2019 Nissan Maxima lacks comprehensive crash-test scores. Some of the biggest changes to the 2019 Nissan Maxima from last year involve active safety features. Last year, the Maxima aced all of its crash tests, and was named an IIHS’ Top Safety Pick. Federal testers gave the Maxima five stars across the board, including a five-star score in the calculated rollover test. Headlights that were rated “Acceptable” or “Poor” by the IIHS last year may do better this year. The Maxima’s standard automatic emergency braking system was rated “Superior” by the IIHS last year at avoiding forward crashes. This year, Maxima SV and higher models are equipped with Nissan’s suite of active safety features, called Safety Shield 360. Blind-spot monitors, adaptive cruise control, forward collision warnings with automatic emergency braking, and rear cross-traffic alert are part of the safety suite. Maxima SR and Platinum models also get traffic sign recognition and active lane control, although the system falls short of the ProPilot Assist features found on other Nissan models. The Maxima adds more airbags for 2019, including driver and front passenger knee airbags. Top-tier 2019 Nissan Maximas rival luxury, but we see its #BestLife as a sportier sedan. Nissan doesn’t leave much out of the 2019 Maxima that we’d ask from a full-size sedan. This year, like last year, the Maxima is offered in five trim levels with increasing creature comforts. 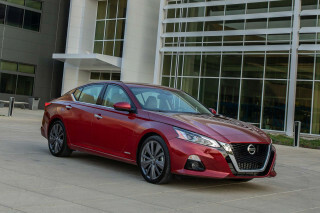 The base 2019 Nissan Maxima S costs just shy of $35,000 and returns 18-inch wheels, cloth upholstery, automatic emergency braking, an 8.0-inch touchscreen for infotainment with Apple CarPlay and Android Auto compatibility, Bluetooth connectivity, power-adjustable front seats and two USB ports. The Maxima is offered in S, SV, SL, SR, and Platinum trim levels. The Maxima Platinum borders on luxury and costs more than $42,000. Those cars are equipped with a heated steering wheel that’s power adjustable, 19-inch wheels, dual-pane sunroof, premium audio, navigation, concierge services, leather upholstery, heated and cooled front seats, wood trim accents inside, a surround-view camera system, and Nissan’s suite of active safety features (that we cover above). The Maxima SR trim level is the sportier pick among the bunch, and one that we’d consider truer to the car’s roots. For more than $40,000, the Maxima SR offers similar equipment to the Platinum model, but skips the concierge services, surround-view camera system (it’s optional), and subs the leather upholstery for grippier synthetic suede. The Maxima SR adds steering wheel-mounted paddle shifters and a sport-tuned suspension, along with sportier exterior accents. Typical to most of Nissan’s vehicles, there are few available a la carte options available for the Maxima. Nissan bundles most of its features into trim levels that add hundreds to the bottom line—sometimes thousands. Frugal shoppers may want to consider the SL trim level or lower, but we’d stop short of going much lower; S- and SV-equipped cars lack interior active noise cancellation and the Maxima’s song isn’t so sweet anymore. The 2019 Nissan Maxima averages 24 mpg combined. The 2019 Nissan Maxima has been updated in many ways from last year, but fuel economy is the same. 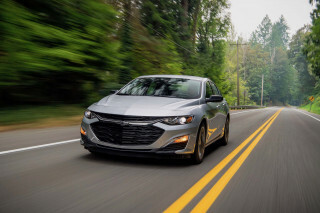 Among big sedans like the Dodge Charger, the Maxima keeps pace but without hybrid batteries, cars like the Toyota Avalon Hybrid leave it far behind.